That’s what my boyfriend, Tom, likes to call fondue — FUNdue. He was disappointed when the headline on my January story for the food section didn’t include that. But it is a fun meal, and delicious too. Read my story below (recipes included! ), and go make fondue for your friends soon! My mother has occasionally made chocolate fondue with a splash of Frangelico (hazelnut liqueur) as a special treat. We’d have plates piled with everything that just gets better with chocolate–strawberries, bananas, pineapple, pound cake, pretzels, marshmallows, coconut macaroons and even cheesecake bites. Once, when we were at the beach with two other families with kids, an afternoon chocolate fondue was inhaled in just a few minutes. My mom had to quickly cut up more dippers to keep us satisfied, and to be sure the adults would at least get a few bites. I’d recommend eating it a little slower than we teens may have wanted to. Drawing out the meal also helps you to not overeat, and to enjoy the flavors more. That’s what my friends and I did this weekend, as we leisurely dipped our food, only dripping cheese and chocolate a few times. 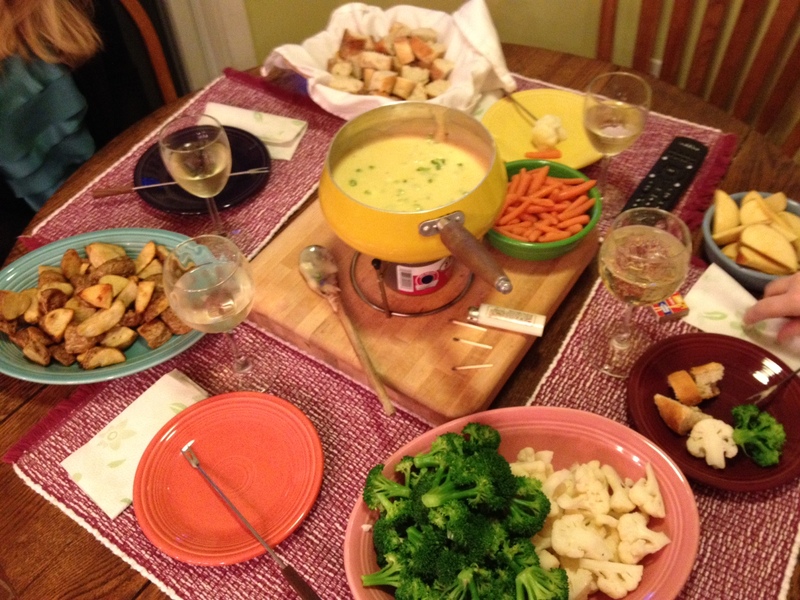 Besides being a fun group activity, fondue is also a romantic meal for just a couple. Tom didn’t like certain foods before we started dating. He was especially hesitant about the cauliflower I picked up at the store. But once it was covered with plenty of cheese, I think he even took a second bite. And since I’m a vegetarian, he was afraid the meal would be all veggies. But we made sure to have plenty of dippers for each of us–tiny roasted potatoes, chunks of bread, pepperoni sticks, and crisp broccoli and carrots, both blanched just for a minute. Apples are also a nice accompaniment for cheese fondue, offering a fresh, crisp bite to carry the heavy cheese. ‹ PreviousWhat does it mean to be baking “together”?